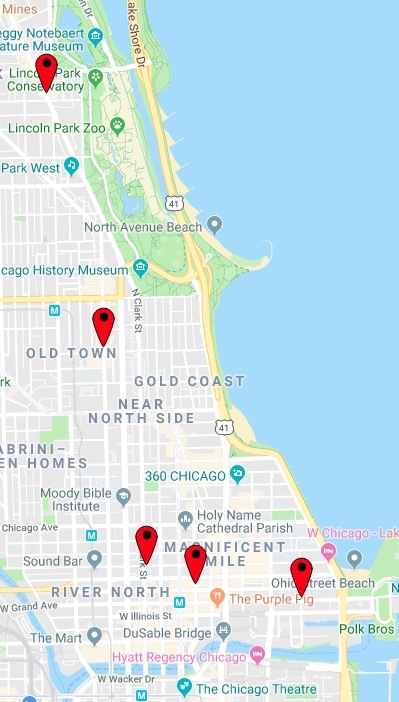 A carload of thieves pulled off a series of at least four robberies stretching from Old Town to Streeterville on Saturday afternoon before police caught up with the crew in River North. Four suspects, believed to be juveniles, are in custody. The first robbery was reported around 12:45 p.m. near the intersection of Wells and Schiller in Old Town. A woman said that a group of teens jumped from a Jeep SUV and took her phone by force. About 40 minutes later, another woman told police that four teens jumped her from behind near Clark and Ontario and took her phone before they ran back to a Jeep Cherokee. The woman confronted the crew and wound up being punched in the face, police said. One of the thieves threw her phone from the SUV as it sped from the scene. Within seconds, yet another woman walked up to a police officer near Ohio and Wabash to report that a thief stole her phone and escaped in a gray or black SUV. Finally, just after 2 p.m., a woman reported being battered and robbed of her phone by a young male in the 400 block of West Grand. Once again, the thief jumped into a waiting SUV that was occupied by three others. Cops caught up with the SUV at 2:15 p.m. near Wabash and Grand. The robbery crew fled in separate directions, but police managed to round them all up within a few minutes. At least one was positively identified as the robber from the Grand Avenue incident, police said. Police said a similar robbery involving a different vehicle and fewer offenders was reported in Lincoln Park on Saturday morning. A woman told police that a male teen took her phone by force in the 2300 block of North Clark near Belden Avenue. Afterward, the suspect ran to a waiting car, which sped south on Clark and then west on Grant Place, police said. The vehicle is a green Subaru hatchback that is missing its front grill. Police said the offender is a black male in his teens. He’s about 6’4” tall and thin, and he wore a hat with black and white Adidas track clothes.